I use potatoes in curry A LOT, I’ve previously shared my creamy vegan curry with new potatoes with you and I’ll be writing up my sweet potato curry for you very soon. But today is all about that roast potato curry – freshly roasted or as an excellent way to use up leftover roast potatoes after a big vegan Sunday roast or Christmas dinner. I served up my curry with rice this time but I also serve it as a small side dish with a selection of small curries and dahl, with naan bread and even stuffed inside my own homemade vegan pita bread. This curry is delicious fresh from the pan and, like so many savoury sauce dishes, even tastier the next day. It is well worth making a double batch so you can take some as a lazy packed lunch or for a super quick vegan supper at the end of a busy day. The spices I have used in this curry are really easy to get hold of in supermarkets, wholefood stores and online. Those little black seeds you can see in my photo are usually sold as Nigella seeds here in the UK, if you are shopping in an Asian supermarket you will also see them labelled as kalongi seeds and sometimes they are called black onion seeds in recipes. In the US they are called charnushka – so many fabulous names for such a little seed! They are one of my favourite spices to add to curries but if you don’t have any to hand and you don’t feel like shopping you can leave them out. I also use turmeric here for its lovely earthy taste but, again, you can leave it out if you don’t have any to hand. The only thing you mustn’t leave out is the curry powder – it wouldn’t be much of a curry without that! Blended curry powders come in all strengths and flavours so choose your favourite. I used a medium strength curry powder which contains a blend of coriander, turmeric, cumin, cassia, chilli powder, black pepper, fennel, ginger and pimento. Choose a potato which is a good roaster, I used Cosmos because that was my potato of the week in my organic veg box but King Edwards and Maris Piper are reliable choices too. I peeled my spuds, chopped them into generous chunks and par boiled them for 5 minutes before draining them and then roughing them up a bit. Leaving them to steam after you’ve drained them then tossing them about in the colander to roughen their edges really helps to create that crispy crunch you need in a good roastie. Heat the vegetable oil in a hot oven, add the drained potatoes, shake the tin so they are coated in the oil, sprinkle with salt and then put them in the hot oven for 30 – 45 minutes (turning once) until brown and crispy. I drain my potatoes on a wire rack over a tea towel to remove some of the oil and to make them even crisper. Next I added the dry spices and fried for 10 seconds until I could smell their aromatic goodness and then added the water and my stock cube along with a pinch of salt and a good grinding of black pepper. I cooked it all together gently for about 10 minutes until it was reduced to a thick sauce, all ready for my potatoes. The roast potatoes are just stirred in and warmed through gently until piping hot and ready to serve! An easy recipe for vegan roast potato curry. Simple, wholesome and comforting this easy curry can be on your table in under an hour. Parboil your prepared potato chunks in a pan of boiling water for 5 minutes. Drain in a colander and leave to steam for a minute or two to dry. Shake your potatoes in the colander to roughen up their edges. Pour 1 tbsp of the vegetable oil into a baking tray and put it into the hot oven for 5 minutes until hot. Add your potatoes to the hot oil, shake to coat and sprinkle with a little salt. Roast in the hot oven for 30-45 mins, turning once, until brown and crisp. (Optional) Drain on a wire rack over a tea towel to remove excess oil and allow them to crisp up even more. Fry the onion very gently in the remaining vegetable oil with the lid on for about 10 - 15 minutes until soft and beginning to brown. Add the garlic and ginger and sizzle it all for a further minute. Add the dry spices and fry for 10 seconds until aromatic. Add the water, stock cube, a pinch of salt and a good grinding of black pepper. Simmer it all together gently for about 10 minutes until reduced to a thick, glossy sauce. Stir in the prepared potatoes, heat through gently until piping hot and serve. 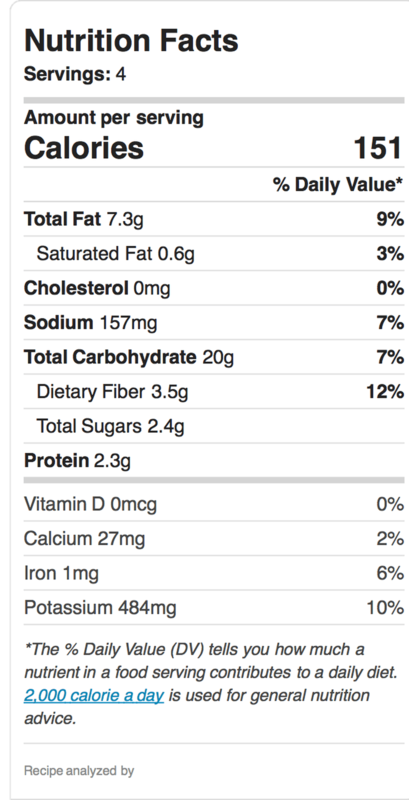 This nutritional information is only an approximate guideline, created using an online calculator. Calculations will vary according to the ingredients you use and your cooking methods. Why not pin my Easy Vegan Roast Potato curry for later?